A group of 18 banks — which includes Goldman Sachs Group Inc., Morgan Stanley, J.P. Morgan Chase & Co., Bank of America Corp. and Citigroup Inc. — understated the debt levels used to fund securities trades by lowering them an average of 42% at the end of each of the past five quarterly periods, the data show. ….”You want your leverage to look better at quarter-end than it actually was during the quarter, to suggest that you’re taking less risk,” says William Tanona, a former Goldman analyst who now heads U.S. financials research at Collins Stewart, a U.K. investment bank. And the good news? 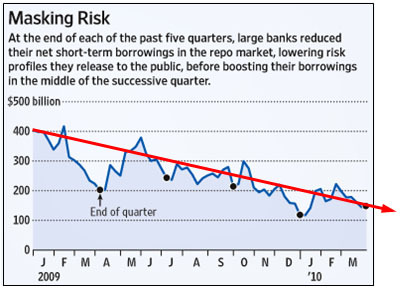 The absolute level of short-term borrowing is going down over time. This might just be an artifact of the current low-interest-rate environment and the general deleveraging of the financial sector following the 2008 crash, but it’s welcome regardless.